"Parks and Recreation" makes a long-awaited return – and just in the nick of time. 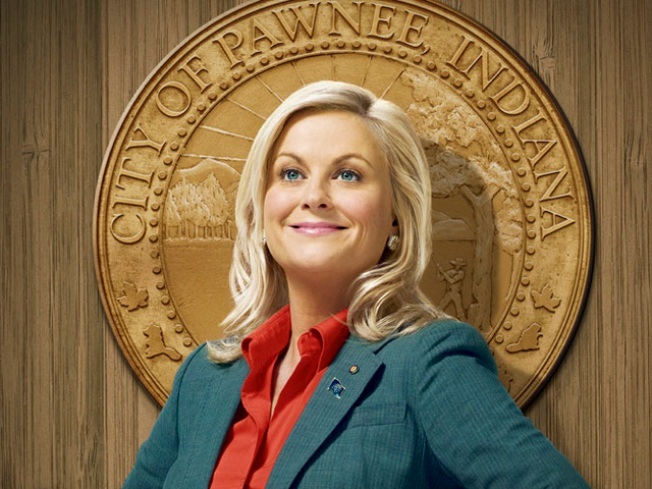 Amy Poehler's "Parks and Recreation" character won't take "Knope" for an answer. All the fuss over who's going to replace Steve Carell in "The Office" intensified last week with news that he'll be leaving the show in April with four episodes left in the season. That's a big void to fill, to be sure. But in the meantime, we're heartened by the comeback of another well-meaning, sometimes clueless TV boss who, like Carell's iconic Michael Scott, is shaping up as a character for our times. Thursday brings the long-awaited return of "Parks and Recreation," an "Office"-style mockumentary staring Amy Poehler as Leslie Knope, a small town bureaucrat who maintains her big dreams, even if minor victories are hard to come by. This ultimately is a comedy about a woman determined to turn a hole in the ground into a park, which plays far funnier than it sounds, thanks to sharp writing and performances. The show, which has logged some 30 episodes to mixed reactions from critics and audiences, was held back as a mid-season replacement – and wound up fitting into NBC's new Thursday sitcom six-pack, between "The Office" and "30 Rock." We're hoping this will be the season "Parks and Recreation" finds the audience it deserves, much like "Community,” another fun NBC Thursday night quirk fest that took a little time to gel. It almost seems unfair to compare "Parks and Recreation" to the sitcoms around it. But like "Community" and "The Office," the show thrives on a strong ensemble cast (Aziz Ansari as the not-so-smooth operator Tom is a standout). And like those shows (and the newer NBC sitcom, "Outsourced") the humor, appeal and relatability are rooted, to some extent, in tough economic times. Last we saw "Parks and Recreation," Knope's department was on the chopping block, thanks to a state auditor whose relentlessly high-intensity sunny attitude belies the budget ax he wields (he’s played by Rob Lowe, who is showing an Alec Baldwin-like comedic flare). Knope might share Michael Scott's tin ear for human interaction, but she's hyper efficient, comically hardworking to the detriment of her personal life and somehow maintains an optimism and determination that eludes most of the sad sacks around her. She won’t let anything – including a backlash after she presided over the “wedding” of two male penguins – get her down. You almost expect that Pawnee, Indiana someday will get that park. The versatile Poehler, who was the stealth weapon of “Saturday Night Live” during her tenure on the show, imbues Knope with a goofy likability due to – or in spite of – her undying belief in the power of government to do good and in the inherent decency of people. You just need to give them time to come around – much like TV audiences. Michael Scott might be on his way out, and it's unclear where "The Office" is headed. But it's comforting to know that we’re at least in for more of the audacity of Knope.